Students interested in majoring in English and Textual Studies (ETS) are invited to an open house in the Department of English. 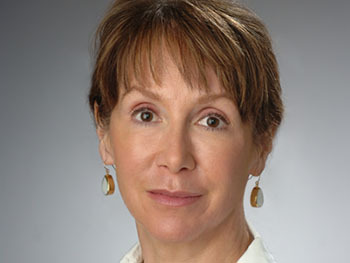 Dympna Callaghan, the William Safire Professor of Modern Letters, exemplifies faculty excellence. The event, which is free and open to the public, will take place on Wednesday, Nov. 2, from 4:30-6:30 p.m. in 401 Hall of Languages. Food and refreshments will be served. For more information, contact Carol Fadda, associate professor of English and director of undergraduate studies, at cfaddaco@syr.edu or 315.443.8790. The English department is based in the College of Arts and Sciences. The program will feature brief remarks by associate professors Mike Goode, Chris Hanson, Patricia Roylance and Stephanie Shirilan; assistant professors Jonathan Dee, Will Scheibel and Meina Yates-Richard; and Sarah Harwell G’05, associate director of Syracuse’s top-ranked M.F.A. program in creative writing. 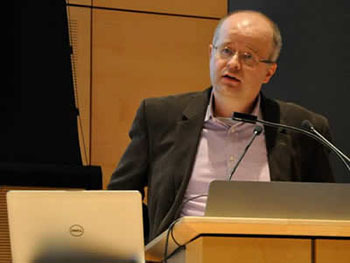 Associate Professor Roger Hallas oversees the film and screen studies program. 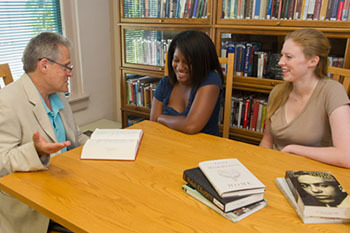 The English department offers multiple opportunities for ETS majors. In addition to earning a B.A. in ETS, students may focus on creative writing or film and screen studies. Also available are a variety of lower- and upper-division courses, including those devoted to aspects of British, American, postcolonial and global literatures and cultures; film studies; and popular culture. Other offerings include the ETS dual major (often used in conjunction with English education), the ETS minor and combined degree programs with other units on campus. In A&S, many ETS majors land jobs in writing/editing, publishing, education, public relations, advertising, law or business/industry. Among its most famous alumni are musician Lou Reed ’64 and authors Joyce Carol Oates ’60, H’00; Alice Sebold ’84; and William Safire ’51, H’78. Department chair Erin Mackie says students benefit from hands-on learning and faculty expertise. Erin Mackie, professor and chair of English, attributes ETS’ success to hands-on learning and to the expertise and dedication of the faculty. She cites, as an example, “Living Writers” (ETS 107), one of the program’s most popular courses. Taught by Harwell, “Living Writers” exposes undergraduates to the literary process. To wit, it is offered in conjunction with the M.F.A.-sponsored Raymond Carver Reading Series. Each year, Harwell brings 12-14 poets and fiction writers to campus as part of the series. Professor Harvey Teres is a sought-after teacher, researcher and faculty advisor. Rounding out the degree program are SU Abroad courses in London, Florence, Madrid, Strasbourg, Beirut and Amman; internships with University Libraries, SU Press or Salt Hill Journal; and freelance writing opportunities with campus publications, such as the Daily Orange, Jerk Magazine or Verbal Seduction. ETS students also may participate in the Distinction Program, in which they complete a senior thesis project and graduate with “Distinction in English and Textual Studies”; the Undergraduate Conference, where they present original material written for ETS courses; and the ETS Career Workshop.